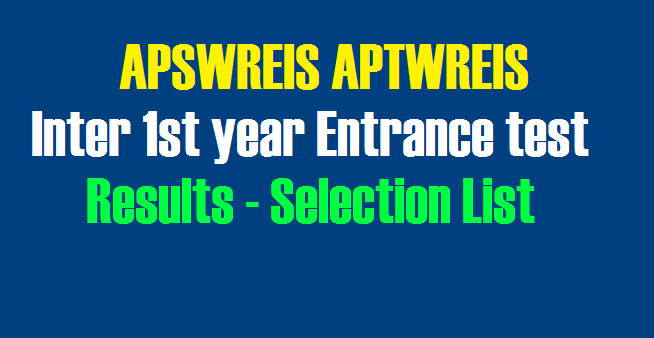 APSWREIS APTWREIS Inter 1st year Entrance test Results 2019, APSWREIS / APTWREIS Results, APSWREIS Inter 1st year Entrance Test 2019 results, APTWREIS Inter 1st year Entrance Test 2019 results, APSWREIS Inter Admission Test 2019 Results, APTWREIS Inter Admission Test 2019 Results are available at apswreis aptwreis web portal at http://apgpcet.apcfss.in/Inter/. AP Gurukul RJC CET Results 2019, APSWREIS RJC CET Results 2019, APTWREIS RJC CET Results 2019, AP ST SC Gurukul RJC CET Results 2019, APSWREIS APTWREIS Entrance Test Results 2019, APSWREIS APTWREIS Inter 1st year Entrance Test Results 2019 available in this page . APSWREIS APTWREIS Inter 1st Year Entrance Test 2019 or AP Social and Tribal Welfare 1st year Intermediate Notification: Andhra Pradesh Social and Tribal Welfare Residential Educational Institutions Society has given the APSWRIES APTWREIS RJC Entrance Test notification on March, 2019 and invited the online applications form Boys and Girls for admissions into 1st year intermediate MPC, BPC, MEC, HEC and CEC with English as the medium of instruction for the academic year 2019-2019 in the APSWR and APTWR institution under the control of APSWREI and APTWREI Society. b. APSWREIS Inter 1st year Admission test will be held in the subjects’ viz., Telugu, English, Mathematics and Science and Social based on the State Syllabus of class X of A.P. State Government. c. The questions will be in objective type (Multiple Choice Questions) and will be in English/Telugu Medium. Test will be conducted in the selected centers of the district. d. The students may choose any one of the centers as per their convenience in the State. 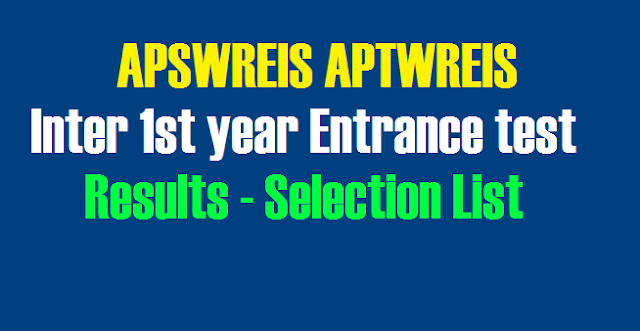 APSWREIS APTWREIS Results web page, Enter your SSC Hall ticket no.